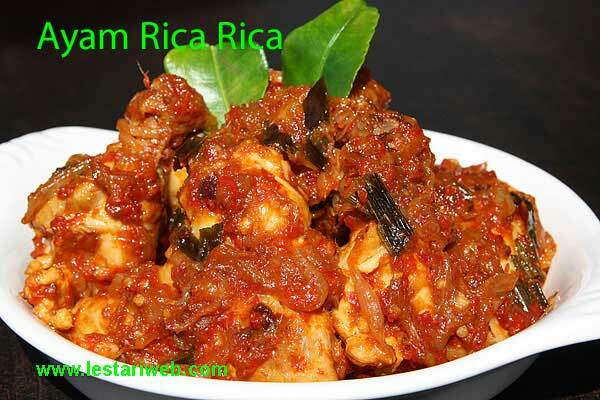 Rica Rica is a one of typical dishes of Minahasan people who live in North Sulawesi. Many Indonesians also call them as Manadonese, refer to the capital city of North Sulawesi province. You can make this dish either with chicken or fish. One of the important ingredients of this recipe is daun pandan or "Pandan leaf". Pandan leaf is not always available in the west, but try to get it from Thai's grocery. You have more chance to get it than in other Asian shops. Nevertheless you need no worry, without "Pandan leaf", it still taste good ;-). In original recipe is 1 free range chicken is used but I made it half since it was too much. If preferred you can also add potatoes in it, like I do. Blend all ingredients for the spice paste in a blender or food processor until smooth. Heat 2 tbsp oil in a wok or fryingpan & stir-fry shallot, lemon grass and pandan leaf until the shalllot is brown. Add the paste and kaffir-lime leaf. Stirring all the time until fragrant. 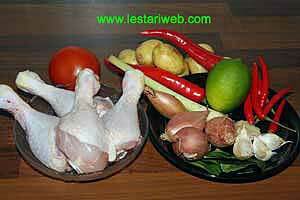 Add the chicken and potatoes, stir and cook until the chicken colours turn to white. Lower the heat into medium, pour in the water and cover the pan. Simmer with cover until the water is absorbed and the chicken is well cooked. Stir occasionally. Add the sliced tomato, cook shortly until just wilted. Add the lime juice, stir to mix. Serve right away. Es ist sehr schwer daun pandan zu finden...aber es geht auch ohne. its worth to try and I did. I add half tsp of galaangal (lengkuas)for stronger flavor. Thaaaanks so much for sharing.